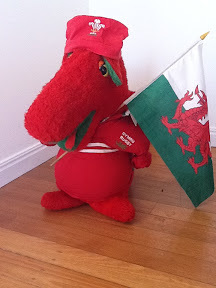 We're ready - Come on Wales! Taffy is all dressed up in Sibs' old rugby shirt and although he's breathing in for the photo it still looks a little tight around that tummy....a few too many welsh cakes I think! A very sad house here tonight. So unfair! They were cheated! They played amazingly and we were in disbelief here at the red card - even then with 1 man down they were incredible - we were gutted for them.